Wet Chemical Extinguishers can be identified by its colour labeling…which is red with oatmeal band. Especially designed for fat and oil fires (Class F). Using Saponification agents, it quickly kills the fire and stops re-ignition by forming a thick layer on the fat/oil. Also suitable for wood and paper fires and also cooking oils and fats. (Class A and Class F). The best restaurant kitchen appliance you can purchase. The recent trend towards efficient cooking appliances and use of unsaturated cooking oils dictates the use of a fire extinguisher with greater fire fighting capacity and cooling effect to combat these very hot and difficult fires. Available in 3.0 Litre and 6.0 Litre sizes. 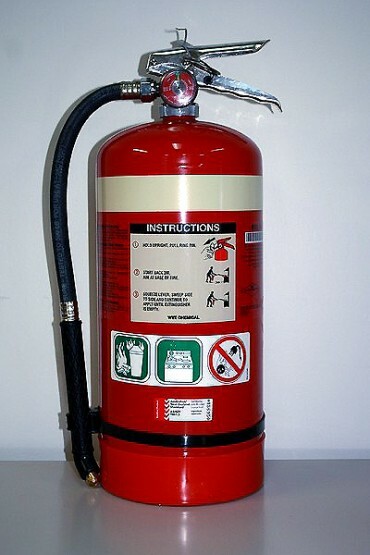 WHY BUY YOUR WET CHEMICAL FIRE EXTINGUISHER FROM LONDON FIRE & SAFE?